This accredited qualification aimed at all staff, particularly new starters in any workplace, where a basic understanding of fire safety is required. Those gaining this qualification will know that fire safety is the responsibility of everyone in the workplace with recognition of the contribution they may have in preventing the start and spread of fires. This level 1 qualification is aimed at anyone who requires a course in fire safety. The qualification is designed to meet and comply with the Regulatory Reform (Fire Safety) Order 2005. It covers regulations, the fire triangle, evacuation, fire equipment, good housekeeping, the law, training requirements, calling the fire service, fire doors, smoke alarms, risk assessing and precautions. We also offer a Level 2 qualification that training for Fire Wardens and Fire Marshals. 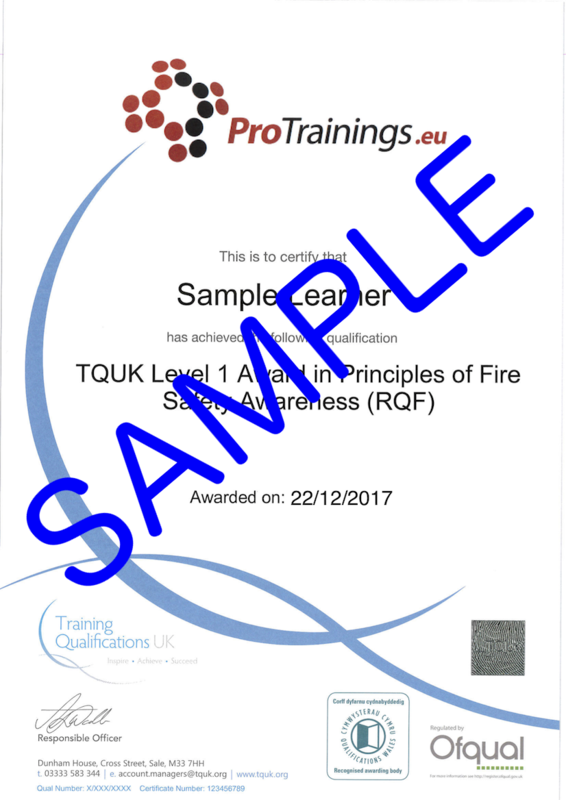 This qualification is ideal to give all members of staff basic fire training to increase awareness and cooperation in the event of a fire in the workplace. Awareness will reduce the risk of fires actually breaking out and therefore save lives.